After the death of Dasaratha, Vashishta advised bringing Bharat and Shatrughna back to Ayodhya from city of Rajagriha in Kekaya kingdom. 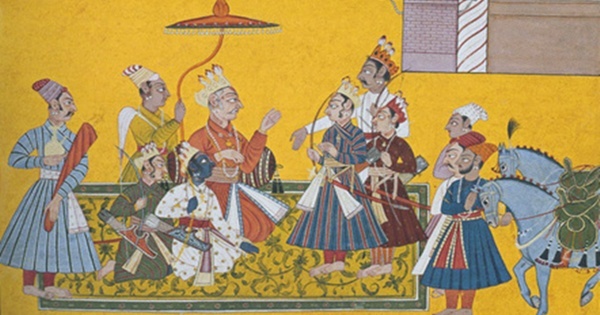 Vashishtha formed a team of messengers from Ayodhya kingdom which comprised of Siddhartha, Vijaya, Jayanta, Asoka and Nandana to bring the younger brothers of Ram and Lakshman from Kekaya kingdom (their Nanihaal). Valmiki Ramayana describes, the messengers through Ayodhya finest horses proceeded in westerly direction for some distance and then crossed the southern end of the Aparatala mountain. Thereafter, they travelled northward along the bank of Malini that flows in between Aparatala and Pralamba mountains. They further crossed Ganga at Hastinapura, and went in the westerly direction through the middle of Kurujangala and reached the country of Panchala. Panchala kingdom was full of lakes and rivers of pellucid waters, they travelled fast with a view to fulfilling their mission. They then crossed the divine river Sardanda of calm waters frequented by fowls of various species and thronged with people. After speedily passing Sardand river they reached a divine tree (of great powers) known as Satyopayachana tree and having gone round and paid homage they entered the Kulinga city. From there they reached a village known as Abhikala and crossed the sacred Ikshumati flowing from Bodhibhavana mountain. This region was enjoyed by fathers and forefathers of Dasaratha. There they saw the Brahmins versed in the Vedas and drank water with cupped palms. Then they continued their journey through the middle of Bahlika country, and reached Sudama mountain. From there they moved further seeing Vipasa, and Salmali rivers, trees, streams, deep wells, ponds, pools, large tanks, different kinds of lions, tigers and elephants. After a prolonged journey the messenger group with their tired horses soon reached Girivraja, the (capital city of Kekaya kingdom) best of cities. Horses entered the lovely city of Rajagriha surrounded by an impassable moat. There they met the king of Kekaya country and his son, Yuddhajit. After messenger asking the princes to come back to Ayodhya, they went to took permission and say goodbye. King of Kekaya generously gave to the son of Kaikeyi (Bharata) in his honour two thousand gold coins and sixteen hundred horses. Similarly his maternal uncle Ashwapati quickly presented him amenable, trustworthy and virtuous counsellors as companions on his return journey. His maternal uncle gave him the wealth of good looking elephants born in Iravata and Indrasira mountains and swift moving and well trained asses which can be yoked easily. He also gave him a gift of well raised dogs of the inner apartment huge bodied with the strength and courage of tigers who used their fangs as weapons. Thus having taken leave of his maternal grandfather and uncle Yuddhajit, Bharata accompanied by Satrughna boarded the chariot and went along. Malini river originates from ranges of shivalik mountains. Just like River Saraswati, Malini river survival is been asked by many activists in Uttarakhand. Kanvashram is an important place both historically, culturally and archaeologically in the history of India. It is located on the bank of river Malini about 14 km from Kotdwara. 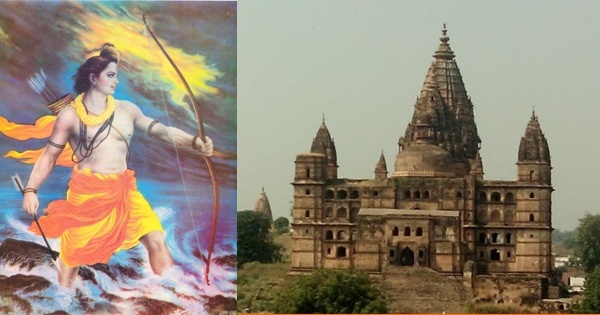 In Valmiki Ramayan, Hastinapur boundary is suggested till north of River Malini, Kotdwara. After crossing Ganga in Hastinapur, messengers went westward and reached Panchala Mahajanapad. The location of Panchala were quite different during period of Ramayana and Mahabharata. Sardanda river should be between Kurukshetra area and Kotdwara. From Shardanda river they reached to Ikshumati which is identified near Kurukshetra. Vipasa river is Beas river and Bahlika country must be between Beas and Kurukshetra. Beas river is currently near Dasuya Forest Division. The area is well known for all types of wild animals. After passing Vipasa river, the messenger reached capital city of Kekeya where king Yudhjit and Ashwajit were present. King Ashwapati daughter’s name was Savitri who married Satyawan, son of King Dyumatsena of the Salwas. The above verses clearly says the messenger reached during night time. The above verse suggests, that Bharat was asleep and had a distressing dream on the very night the messengers were entering the city. So time must be late night. Above verses suggests, that the talks started in next morning of death of Dasaratha, at sunrise between the counselor sages to bring Bharat and Shatrughna. Above verses suggests, Vashishtha atonce made a team of messengers of Siddhartha, Vijaya, Jayanta, Asoka and Nandana and ordered to go to Kekaya Kingdom on swift horses. The messengers might have left after few hours of sunrise and reached capital city now known as Sialkot around late night. Roughly they travelled between 15-16 hours and horses were also tired. Ayodhya to Beas (Vipasa River) is approx 1050 Kilometers and approx 170 kilometer more to Capital City which is now identified as Sialkot. They travelled 1220 km approximate in a day. If taken 16 hours, the average horse speed would be ~75 km/hour.